The sculptures shown here represent a very small selection from the last twenty years of my four decades of commitment to connecting people with the unseen forces. I use this as a comprehensive term for what can alternatively be called nature, God, Mother Earth, the spiritual realm, or even aspects of physics, such as gravity, dark matter, or chaos theory. It has, and always will be, the nature of humankind to seek ways of revealing that which we can not fully comprehend or adequately express. 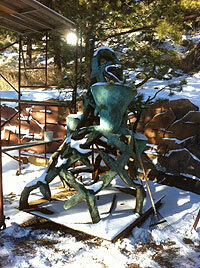 These sculptures, along with my gardens, give a glimpse into my search for this expression. And my current series of micro-landscapes — which can go inside or out, in gardens or urban courtyards or plazas —are simply the latest articulation of this persistent quest.